The son of a Presbyterian minister, MacWherter grew up in Macon County, Illinois and graduated from Decatur High School in 1913, before there were yearbooks that could detail his athletic prowess. It appears that he participated in Millikin’s music conservatory programs as a singer before enrolling as a fulltime student in September 1915 and sang bass in the men’s glee club. He also won his varsity sweater and “M” in football that fall. 1916 was the first year Millikin was known as the “Big Blue” and along with future Staley teammates Sidney Gepford and Leo Johnson the football team were “state champions.” The 1916 university yearbook stated, “Mac played full [back] and his combined weight and speed made him a ‘frightful thing’ to his opponents.” Kile was so good that his fellow lettermen elected him captain for the coming 1917 team. However, in January 1917 he left J.M.U. to teach industrial arts at Monmouth High School and then that summer joined the Marines. The following fall Mac was enticed to play for money and worked at Staley’s while practicing football every afternoon. Kile played fullback and linebacker. He subbed in four of the first five games that season and is given NFL credit for playing against the Chicago Tigers in front of 4000 people at Cubs Park on October 10, 1920. He received a $300.00 bonus from Staley’s in December for his football work and returned to Wrigley Field 36 years later to be honored as one of the first “Bears”. Mac graduated from Bethany in June 1925 and returned to Decatur where he married his former Millikin classmate Ruth Smith on July 30th as Kile’s father officiated. In late August the newlyweds moved to Wilson, North Carolina, where Kile served as athletic director for the next eight years while coaching football, basketball, baseball and wrestling. He returned to Central Illinois in 1934 to teach and coach football, basketball and baseball at Arcola High School. His Purple Riders’ football teams were hugely successful for three seasons, including one string of 33 straight games without a defeat. MacWherter was then lured away to teach and coach at his Alma Mater, Decatur High School for $2300.00 a year. 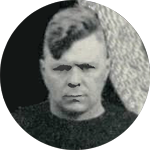 MacWherter was not as successful at the large-school level in Illinois and left in 1941 to coach at Martinsville High School in Clark County, Illinois. In 1943 he took a job as a land and field appraiser with the Pipe Line Department of the Ohio Oil Company in Martinsville. He retired in 1958 to a farm in Clark County and in 1962 this Republican won a term as Clark County Treasurer. After his wife died in 1966 Kile moved to Greely, Colorado. He died in Las Vegas, Nevada, at the age of 85 and was buried next to Ruth in the Oak Ridge Cemetery in Springfield, Illinois.